Entente: Lakeview’s Michelin-starred Entente has rolled out a bevy of new seasonal dishes for the summer as part of its build-your-own tasting menu offerings. With the freshest flavors in mind, chef Brian Fisher has concocted a spree of dishes like kampachi with green almonds, coconut, kaffir lime, cocoa nib and lobster chili oil; rabbit cappelletti with fava beans, sugar snap peas, ham, golden balsamic and pecorino; tandoori octopus with wheat berries, date “vindaloo,” yogurt, vadouvan, carrots and turmeric; and Pekin duck with duck rillettes, strawberry confit, English peas and white chocolate. 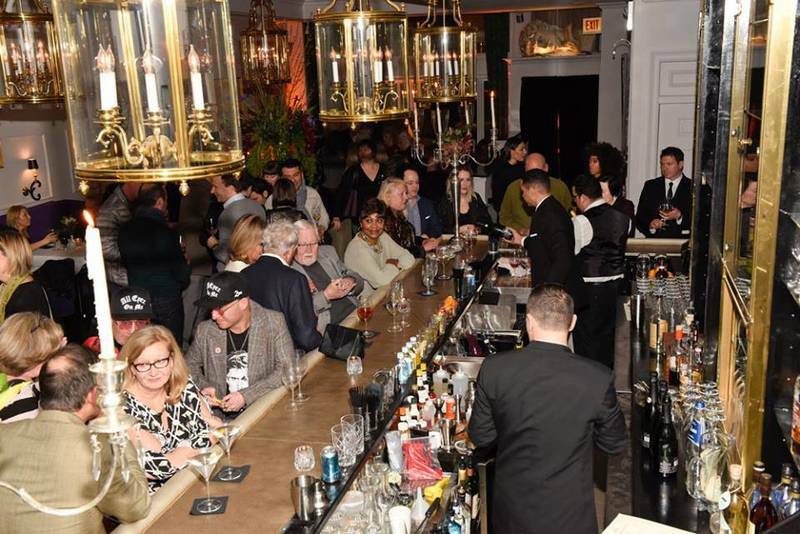 avec: Providing a new reason to stay up late in the West Loop (as if you needed another reason), avec has rolled out some alluring late-night options to help cap off a night of bar-hopping. 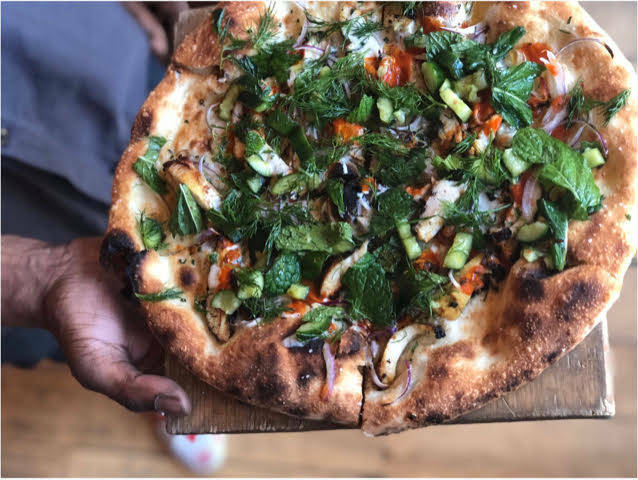 Combining two meaty, comforting favorites into one, chef de cuisine Perry Hendrix has debuted a shawarma pizza, outfitted with chicken that’s been marinated in shawarma spices and grilled over an open fire. The chicken is pulled and added to the pizza dough, hearth-baked with herbs and red onion, then finished with a smattering of fresh cucumbers, mint and dill. The sauce is a combo of white sauce made from garlic toum and red sauce made with piri piri hot sauce. The stunning creation is available on the late-night menu after 10 p.m.
Remington’s: Summer is undoubtedly picnic season. But packing your own picnic provisions can be a little daunting and tiresome. Go the easy (and delicious) route by snagging a basket from Remington’s on Michigan Avenue. The Millennium Park-adjacent restaurant has picnic baskets ready to go for the season, with customizable options like artisanal meats and cheeses, sandwiches, salads, snacks, dips and drinks. Trout dip, housemade cole slaw, grilled artichokes, crab Louis, shaved prime rib and Italian subs can all be yours. Orders must be placed at least 24 hours in advance, and all baskets come with napkins, plates, silverware, wet naps and serving utensils. The Ruin Daily: The de facto sandwich of the summer this year may very well be the fusion creation being served at The Ruin Daily in the West Loop. Ever the inventive sandwich shop, the eatery has mashed up two iconic sandwiches, the meatball sub and the banh mi, for an unforgettable meal. It starts with a crusty Italian baguette, which serves as the foundation for beef and basil meatballs, peanut hoisin sauce, housemade pickled jalapeños, cilantro chutney and shredded carrots. 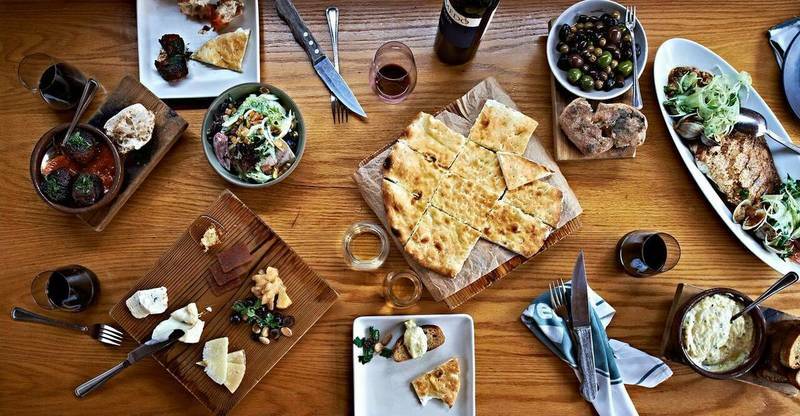 Fort Willow: Bucktown’s most whimsical newcomer continues to innovate and delight, with the latest example being the addition of a “Big Bite” to its menu of internationally inspired snacks and dishes. The “Classic” is a nod to Americana comfort food, which is a clever departure from the rest of Fort Willow’s tapas-style plates. The combo dish contains a grilled cheese-style sandwich made with cheddar, Havarti and ramp pesto, paired with a baked goat cheese and tomato soup. Keep in mind: the “Classic” changes ingredients every few weeks or so, but the heart and soul remains the grilled cheese-tomato soup pairing, which is a worthy summer nosh in and of itself. 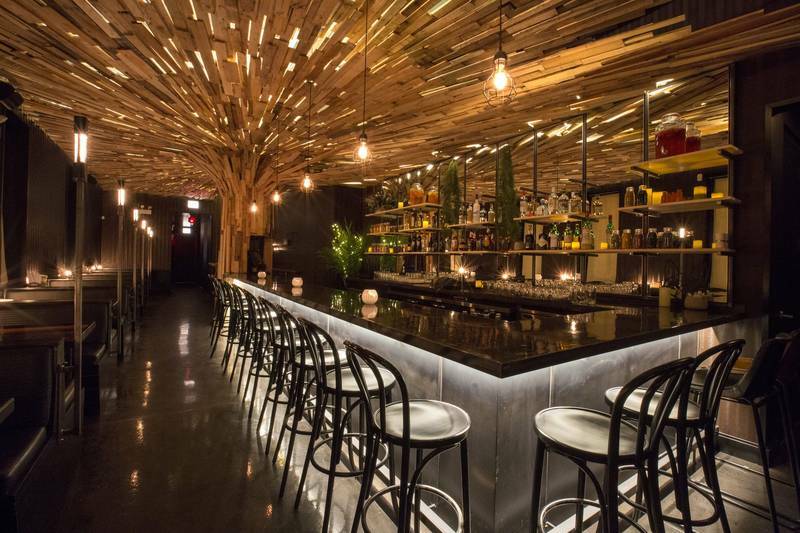 El Che Bar: Now that it’s summer, appetites turn towards the grill. 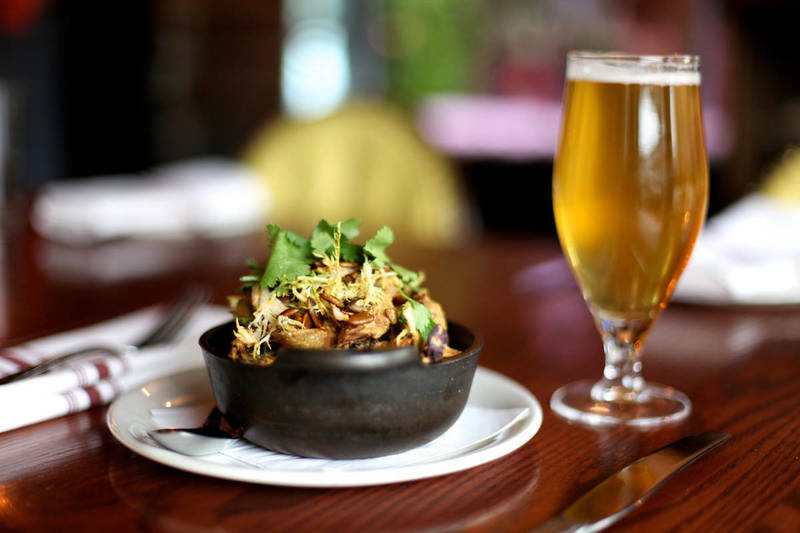 And no better place to satisfy said cravings than at grill-centric El Che Bar. The Argentine-inspired West Loop hot spot has the perfect dish that sings of summer. The parillada, named for the iron grill barbecue it’s cooked on, is a meaty masterpiece from John Manion. The chef/owner outfits his grills with the likes of spicy chorizo, morcilla sausages, sweetbreads, bone marrow and asado-style flank steak. Smoked salt, salsa criolla and housemade chimichurri provide accompanying seasonings, and the massive platters go for $80 each, with enough food to feed a hungry group. Cocoa + Co.: When it comes to dessert in the summer, ice cream sandwiches are quintessential. And nowhere in Chicago are they more lavish, decadent and indulgent than at Old Town’s chocoholic wonderland, Cocoa + Co. The sweets shop has brought back its giant Oreo ice cream sandwiches for the season. Handmade in the shop, each sandwich is heaped with Homer’s Ice Cream on three-inch Oreos. Flavors include coffee ice cream rolled in pecans, vanilla ice cream rolled in crushed Oreos and peppermint ice cream rolled in crushed peppermints.